Material and Finish: This Ithaca Style cable railing is made of solid aluminum with an oil-rubbed bronze powder-coated finish. The cables and fittings are 316 marine grade stainless steel. The exterior railing has an IPE top rail and the interior railings have a maple top rail. This guesthouse was designed to play off the historic and natural elements of the area. The structure overlooks the harbor and blends stone, steel, and wood. 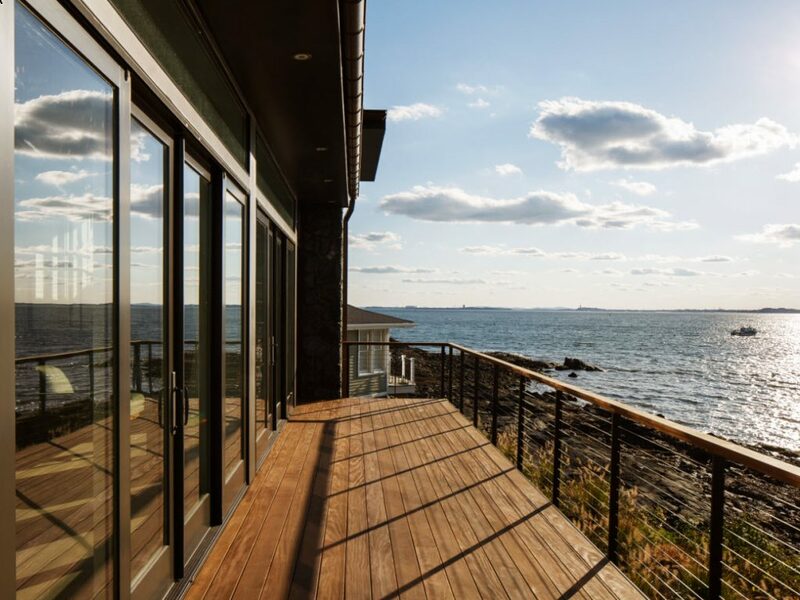 In order to maintain the pristine ocean view, the homeowners chose Keuka Studios cable railing for the exterior deck as well as interior stairs. For the exterior applications, our clients chose IPE, also known as Brazilian walnut, for the top rail because the material holds up well in the salty sea air environment. The top rail matches Ithaca Style solid aluminum posts with an oil-rubbed bronze powder-coated finish. Solid aluminum has the benefit of being corrosion resistant and durable. Our clients wanted to create an interior with clean lines and simple details. For the indoor railing systems, they chose the same railing design as the exterior deck but with a maple top rail instead of IPE.